"This book is by far the best one I have read about back pain...a user-friendly, positive, helpful book on back pain that I will certainly recommend to all my patients."--C. B. Lewis, Ph.D.
Dr. Loren Fishman, a distinguished clinician and a trailblazer in the treatment of sciatica, believes there's only one road to relief: patients must become partners with their doctors in naming the cause of their pain and in making treatment decisions. 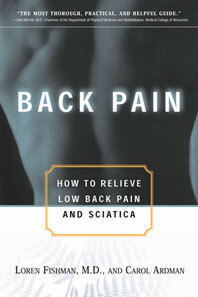 Based on the latest research and on Dr. Fishman's fifteen years of experience in treating patients successfully, Back Pain is filled with pain-saving advice and instructional facts: so many adults suffer bouts of back pain that many doctors consider them normal occurrences; like a cold or flu more than four days of bed rest can make a back ache worse; patients who choose chiropractors visit them twice as often as those who choose medical doctors more than 25 percent of people who go to orthopedic surgeons have referred themselves; the initial treatment any doctor is likely to prescribe is aspirin; sciatica is one of the three major causes of back pain.